I was invited to a tasting at the new Tangier’s Bistro Bar and Martini Lounge in Canton, where Red Fish used to be. I loved the red façade and wonderfully large wooden bar. I wasn’t really transported to Morocco, as it said on the website, but it is a nice looking place. Perhaps the Martini Lounge upstairs is where the Moroccan style shows through? Dan and I got there around 7:30 and started to peruse the menu. The menu itself is deceptively small. It looks large, and then you realize most of the page is taken up with explanations of the dishes. I actually appreciated the explanations – it definitely is better to know exactly what you are ordering rather than guessing. All of the items on the menus are “mezze” or basically appetizer portions – so you are greeted with very nice prices! The drink list is large, even more so than the food menu! As I mentioned, Tangier does have a Martini Lounge, so if you love Martinis you will not be disappointed with the selection. 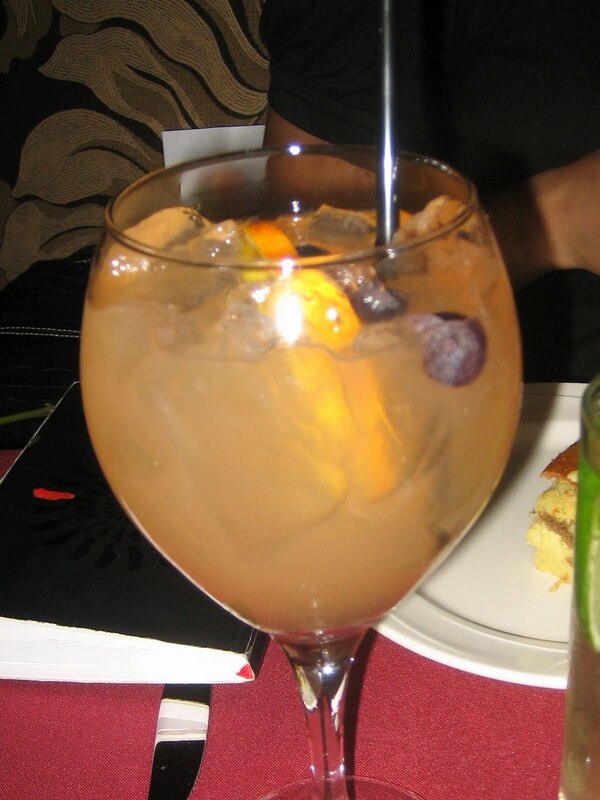 I, however, really LOVED the White Sangria ($7) and would probably order that again and again. It was incredibly fruity and tasted like sweet sweet juice. The Mojito ($10) was WAY too strong and warm(? ), but the French75 ($9) with gin, lime, sugar and a touch of champagne was nice, though I did not taste any champagne. Wouldn’t that mean there would be bubbles? I am not sure, but I didn't see any nor taste anything other than gin. Though the menu isn’t split into appetizers and entrees, Dan and I still wanted to order that way – mostly because our table was small and we didn’t have too much room to try multiple things at a time. 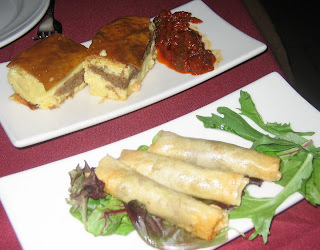 We first started with the Briouates Cigars ($9) and the Beef Parmentiers ($9). The Briouates were crispy and were filled with finely ground meat with spicy flavorings. I enjoyed these a lot, though they reminded me of tiny spring rolls, so I was constantly looking around to dip them into something. The Parmentiers were also tasty – a Moroccan version of a shepherd’s pie in fact. It comes with some tchouktchouka (stewed tomatoes, peppers and garlic - you can get this as an individual Mezze for $8) on the side, which I thought went PERFECTLY. Background-Foreground: Chicken Bastilla, Chicken Shish Kebab, Chicken Tagine. 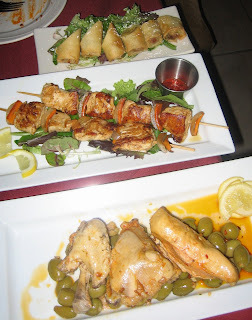 We then ordered plates of the Chicken Bastilla ($10), Merguez Shish Kebabs ($11), and Chicken Tagine ($10). We received some Chicken Shish Kebabs ($10) by mistake, so we ate those too – no need to send that back! The Chicken Bastilla reminded me A LOT of the Briouates, though sweeter since they’re sprinkled with confectioner’s sugar. I liked these a lot as well, but I would suggest either getting this or the Briouates because otherwise they are much too similar. The Chicken Kebabs were good, though a little plain. This would be the perfect dish for someone who is a little wary of International Cuisine – a good starter into the world of Moroccan food. 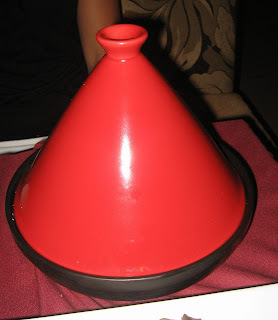 The Chicken Tagine was wonderful, the chicken meat itself was extremely flavorful and moist. It did sit on the most olives I’ve ever seen in my life though– WOH! The Merguez Shish Kebabs were wonderfully little cigar shaped kebabs. I loved the color and the flavor of the meat. I’ve never tried anything like that. 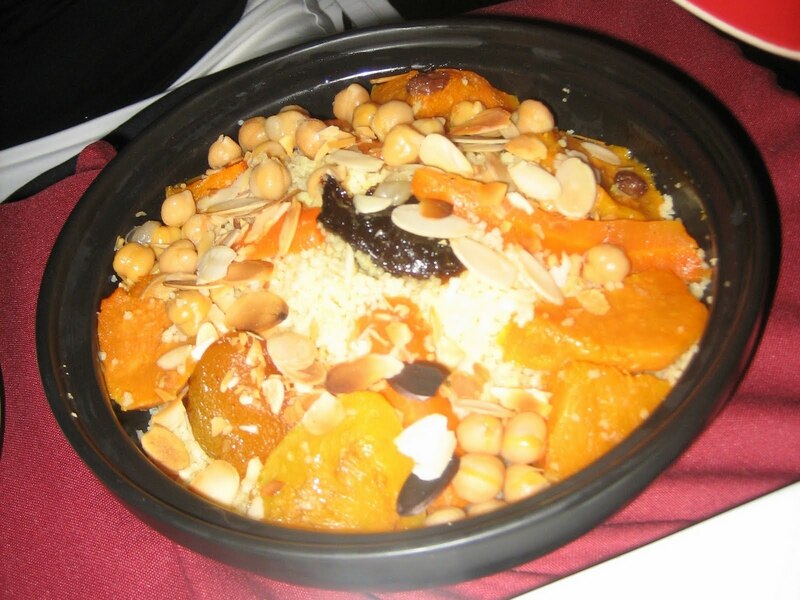 We were given an actual tagine (a conical pot) of Vegetarian Couscous ($14) which comes with dried fruit, sweet potatoes, butternut squash(?) and chickpeas. I loooooooooved this couscous. In fact, I took some for work the next day because there was so much since it’s the only item offered as a full entree. This was curious to me – nothing else but vegetarian couscous? That seems random. I was happy because I thought it was a perfect complement to the Chicken Tagine. 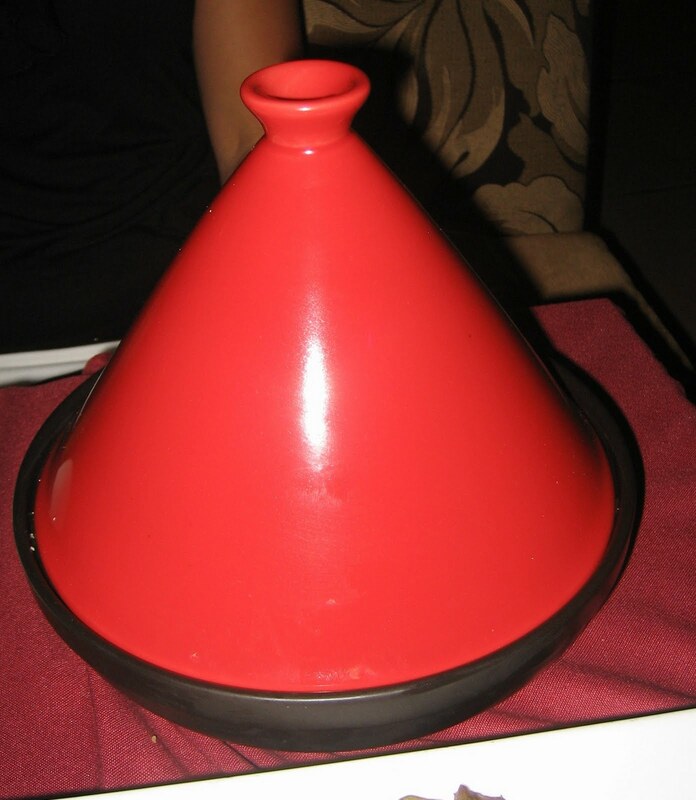 I asked the owner if someone could order a small side of couscous instead to go with the tagine – and he said yes. I would highly suggest people to do that, especially if it would save you the higher price tag. If you are vegetarian however, this is a great item to order since most of the menu items are meat-filled. Probably one of my very favorite items on the menu was the Assorted Moroccan Pastries Plate ($3pp) which are all different and handmade by the owner's lovely Aunt, who I had the pleasure of speaking with. They are each very different - some with lots of honey, others with coconut, another with dates and another with almond paste. This was just a huge treat. 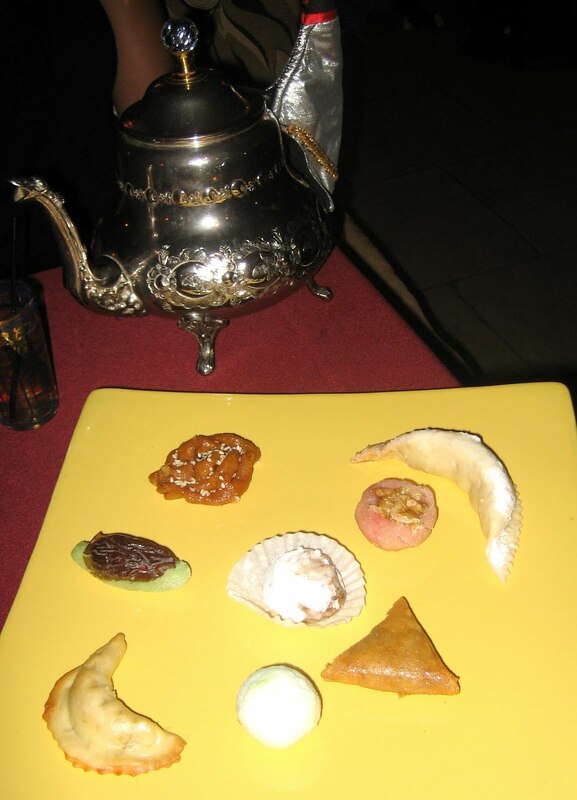 And with a pot of mint tea ($2pp)....ahhhhhhhhhhhhh I could have sit here for hours and been content. Now, I have to be honest here, the service was a bit shaky. We didn't receive our first drink until half an hour after we arrived and then our first plate of food until an HOUR after we arrived. We also had a couple of wrong orders of things as well. I will chalk it up to them still being new and starting out, although the owner, Alan Suissa insisted it was because he was not in the kitchen ahahahaha. Either way, I hope that everything gets sorted out and running a little faster! If I were to go again, I would get some White Sangria, the Chicken Tagine (with a side of couscous), the Merguez Shish Kebab and the Assorted Dessert Plate. Those were definitely my favorites. DISCLAIMER: Though this was a free tasting, I was not asked to write a positive review and felt no inclination to write anything which did not reflect my true opinion of Tangier's. Great review! I mentioned you in my Examiner review: http://tinyurl.com/2ef6q94. Hope you don't mind!